Republican Larry Hogan Jr.’s stunningly easy romp over Democrat Anthony Brown in Maryland’s race for governor can’t be written off as a fluke. Fundamental changes are taking place that could give Republicans a strong advantage down the road in what is generally considered a deeply blue state. You can call it the curse of the one-party state. Common wisdom has it that given the Democrats’ 2-1 commanding lead in Maryland’s voter registration, Democratic victory in big races is a foregone conclusion. But the common wisdom often is wrong. In three of the state’s biggest jurisdictions, Democrats hold such a massive registration lead that the local Republican Party is on life support. Big turnouts in Baltimore City, Prince George’s County and Montgomery County should be enough to ensure statewide Democratic triumph. Yet that didn’t happen this year because turnout in those three locations was terrible. Only 36% of city voters went to the polls; 38% in Prince George’s and just 39% in Montgomery. 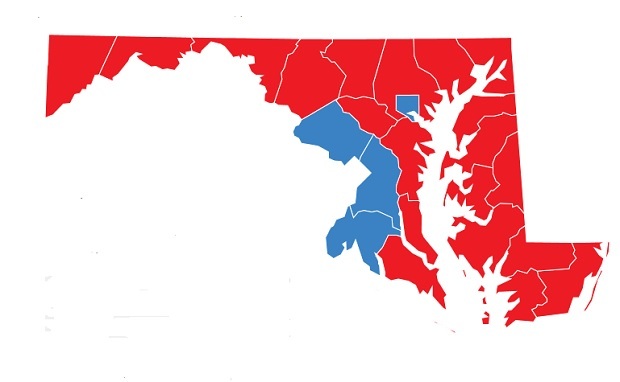 Compare that with the turnout in counties where Hogan piled up big numbers: Baltimore County, 49%, Frederick County, 51%, Harford County, 54% and Howard County, 52%. Democrats must be scratching their heads. This shouldn’t be happening! If the Big 3 jurisdictions had turned out in force, Brown would be addressing invitations to his inaugural ball. Even more puzzling is the fact that all three of those jurisdictions have seen big jumps in registered voters over the past 12 years — 79,000 more voters in the city, 168,000 more in Montgomery and 178,000 more voters in Prince George’s — nearly all Democrats. With 1,553,000 Big 3 registered voters, who usually support the Democrat by 4-1 or 5-1 margins, how could Brown possibly lose? Blame it on the Democrats’ greatest strength — their huge advantage in people identifying with the party. In this case, it is a curse rather than a blessing. Here’s what’s happening: In Baltimore City, there hasn’t been a Republican mayor in 50 years. There hasn’t been a Republican state legislator or councilman from the city in 60 years. No Republican has held elective office in Baltimore in half a century. So it’s no surprise Baltimore voters don’t take the mid-term general election seriously. All the local races this year were decided in the June Democratic primary. Indeed, only one of the city’s six state Senate districts even had a nominal Republican on the ballot. He got 6% of the vote. The situation is similar in Prince George’s, where the last Republican county executive was Larry Hogan’s father and namesake — 34 years ago. No Republican has held a local office for decades. Montgomery is following that same trend. James P. Gleason was the one and only Republican county executive, last elected in 1978. Republicans used to capture local seats in the upper sections of the county, but no more. It, too, is now a one-party monopoly. That should be good for the Democratic Party, right? One-party rule turns general elections into mere formalities. Local political clubs don’t get energized. Local politicians don’t bother campaigning. The local party is on cruise control. Democratic voters feel the same way. Why go to the polls in November when all the local races already have been decided? This trend started decades ago and we’re now seeing the corrosive effects. The last time there was an open seat for governor – 2002 – the general election turnout was 53% in the city, 52% in Prince George’s and 64% in Montgomery. Contrast that with this month’s turnout and you see a precipitous plunge in voters going to be polls. The decline in Baltimore was 18%, 14% in Prince George’s and a huge drop of 25% in Montgomery’s voter participation. That last figure is the most stunning number of all. Montgomery County is famed for its acute awareness of a citizen’s obligations to cast a ballot and take an active role in the political process. Good government and close attention to local government issues is deeply rooted in this county. Yet even with 168,000 more registered voters than 12 years ago, 48,000 fewer ballots were cast this month in Montgomery. The ennui in Montgomery should deeply disturb state Democrats. A 25% decline in turnout over a 12-year period is a calamity. Add that to similar trends in Prince George’s and Baltimore and you begin to understand why a Republican is hiring the Kane Company to move his furniture to the Governor’s Mansion. Is biggest attribute a fatal flaw? It’s ironic. The Democrats’ greatest attribute is now a potential fatal flaw. Without competitive, two-party elections, the party in power relaxes. It gets sloppy and complacent. It gets lazy and even arrogant. It can’t energize its members. Hogan capitalized on this chink in the Democrats’ armor because his strongholds turned out in big numbers. His supporters were highly motivated. They showed up to vote. What will happen four years from now? Or in eight years? One-party Democratic rule won’t change in the Big 3 any time soon — if ever. The one-party mentality could grow even stronger, with lackluster turnouts in mid-term November elections. It’s an Achilles heel that the Democratic Party, despite its huge edge in identified supporters, doesn’t know how to protect. Barry Rascovar’s blog is www.politicalmaryland.com. He can be reached at brascovar@hotmail.com. Schoolyard scuffles and fights amongst angsty teens are common in America’s public schools. In recent years, national anti-violence campaigns have helped reduce school violence. But Baltimore City schools, which have also improved on some measures in recent years, are generally more dangerous for students than schools in the rest of the nation. Source: Centers for Disease Control and Prevention 2005 and 2013 Youth Risk Behavior Survey.